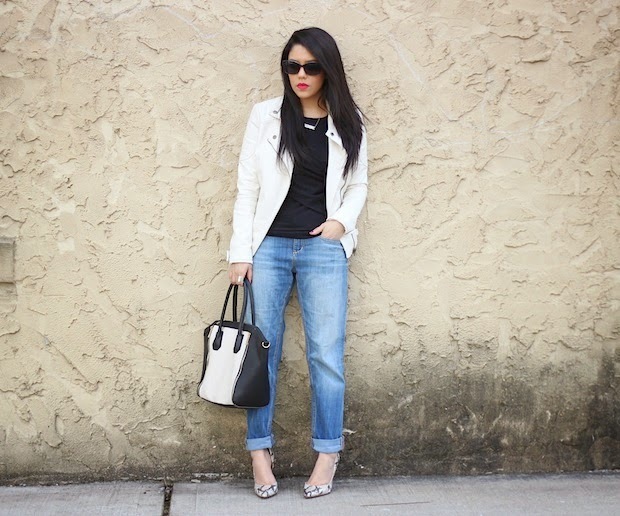 I traded in my skinnies and blazer for a pair of comfy boyfriend jeans and moto jacket! On days where I have a couple of things lined up, I like to be a little more casual. I still wear my heels, but it’s more comfortable for me to wear pieces that are super easy to move around in. A few days ago I had a couple of meetings & previews in the city so I decided to bring my boyfriend jeans back out to play! My favorite thing about BF denim is their looser and more relaxed fit. I like to go a size up in them to make them even more relaxed. They end up sitting right above my hip without feeling too tight. 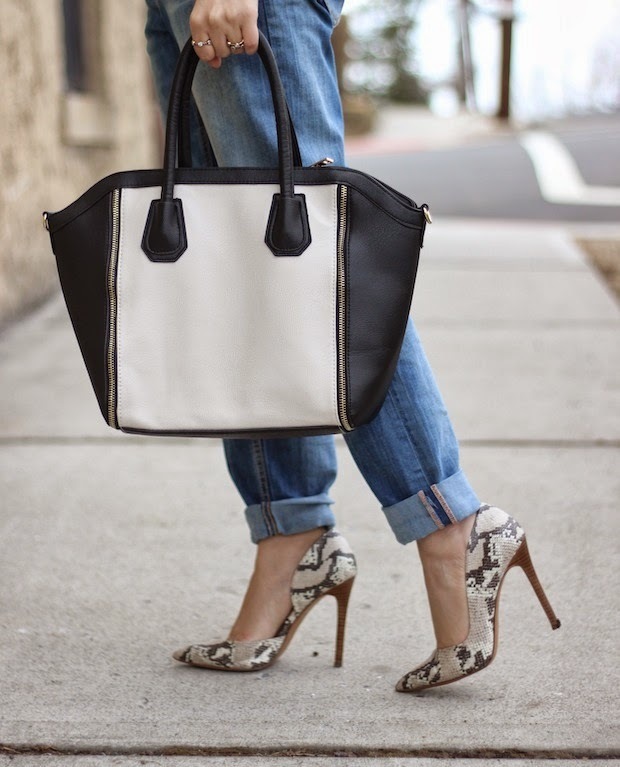 I decided to keep it all neutral and went with a classic black/white combo with a little pop of print from these snakeskin heels. My love for faux leather moto jackets has grown tremendously this past year. I have been wanting a white one for the longest time so I am now in love with this! I guarantee it will be seen on the blog a lot this upcoming spring. The same thing goes with this bag and I think it was a great way to complete the whole look. 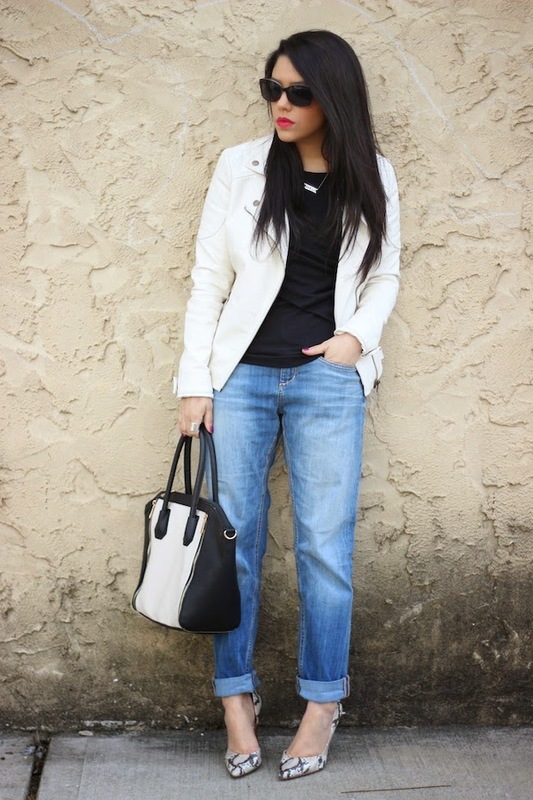 Super cute look – love the bag! Very casual, Very Chic. Love! I love a good bf jean. those nine west heels are really pretty. have a good week, Naty! I love those jeans! Hopefully H&M still has this style so I can go check it out!